A happy, hearty, wholesome Sunday dinner is just what the family needs, and this hearty meal is enough to satisfy the whole gang. It starts with our 2 lb. 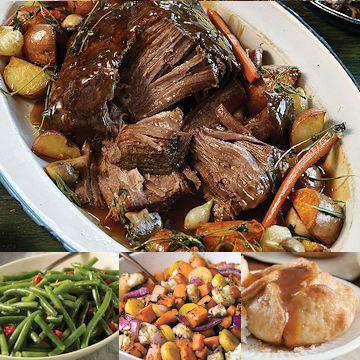 Pot Roast , a delicious and authentic roast that's precooked and easy to heat to perfection. It's paired with traditional sides - melange of root vegetables is colorful, flavorful, and easy to make. Our chefs have chopped big chunks of sweet potatoes, cauliflower, yellow carrots, and red onion and fire-roasted them to perfection. Also included are crisp seasoned Green Beans. For dessert, everyone loves our ooey, gooey, rich Caramel Apple Tartlets. Meal serves 4 - 6. FROM THAWED: Thaw in refrigerator.�Oven: Preheat oven to 400 degrees F. Remove thawed roast and juice from package and place in covered pan. Bake for 40-50 minutes. Do Not Thaw.�Oven: Preheat oven to 450�F. Remove vegetables from packaging. Spread in single layer on a rimmed baking sheet. Toss with 1 tablespoon olive oil, � teaspoon salt and ⅛ teaspoon ground black pepper. Roast for 25 minutes until golden brown and tender.�Microwave (1100 Watt): Remove vegetables from packaging. Place in a microwave-safe dish. Toss with 1 tablespoon olive oil, � teaspoon salt and ⅛ teaspoon ground black pepper. Cover with plastic wrap venting one corner. Microwave on HIGH 3 minutes. Carefully peel back film; stir. Microwave an additional 1 � minutes or until tender. Do Not Thaw!�Bake: Preheat oven to 400 degrees F. Remove tartlet from cellophane bag. Place on foil lined baking sheet allowing space between each piece. Bake for 18-20 minutes.�Microwave: * Remove tartlet from cellophane bag. Place on microwave safe plate. Microwave on HIGH for 60-70 seconds. *Cooking time based on 1100-watt microwave with turntable. Adjust time for lower wattage microwaves. If not using a turntable, rotate once while cooking. Ingredients: Beef Chuck Roast. Rubbed with a 3% Mixture of Dextrose, Salt, Hydrolyzed Corn Protein, Caramel Color, Beef Stock, Natural Flavors, Spices, Dehydrated Onion & Garlic, Extractive Of Paprika, Tetrasodium Pyrophosphate, and less than 2% Soybean Oil added to prevent caking.